The first Airbus aircraft produced by the company’s U.S. manufacturing plant in Mobile, Alabama, performed its maiden flight on March 21 as part of its production testing program. The A321, destined for New York-based JetBlue, took off from the Mobile Aeroplex at Brookley in Mobile at 9:36 a.m., performed its test sequences, and landed at 1:02 p.m. Flown by test pilots Mark McCullins and Bruce MacDonald, the aircraft underwent tests on systems, engines and structure performance. Following the first flight, the aircraft will go through a few more weeks in final production before delivery to JetBlue early in the second quarter. 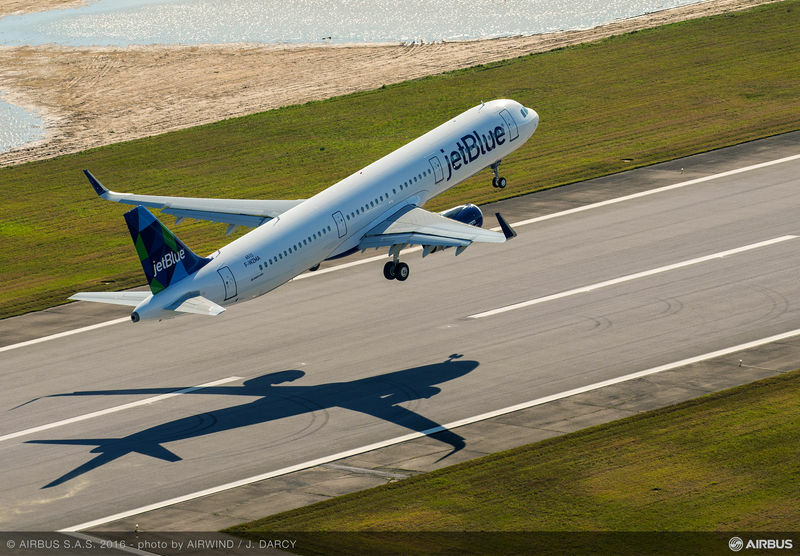 Airbus plans to deliver the second A321 from Mobile to American Airlines soon after first delivery to JetBlue. Airbus expects A321s to account for 49 out of the first 50 A320-family jets delivered from the Mobile plant. Because Airbus does not expect to reach its planned rate of four aircraft a month--or about 50 deliveries a year—until the end of 2017, A321s or A321neos will account for almost every aircraft delivered from Mobile until well into 2018. The Europe-based airframer expects to transition to A320neo-family production at Mobile at the end of 2017 or at the beginning of 2018. Airbus has invested some $600 million at the Mobile Aeroplex at Brookley, site of a former U.S. air force base that closed in the 1960s. Two of the site's biggest advantages for Airbus include its 9,618-foot runway and its location next to Mobile Bay, from where ships can unload large aircraft assemblies that can travel by road to Brookley within minutes. The Airbus facility sits on a 116-acre plot of land, directly adjacent to another parcel of the same size that the company could use to double capacity in the future.